Neil Armstrong (Ryan Gosling) is a fiercely private man, who doesn’t necessarily choose the most marketable words when asked questions about his role in the United States space program. He is someone who cherishes his family and friends, and keeps his emotions close. Standoffish even to his own children, during those few moments when he would let someone into his inner world, they are almost always his wife Janet (Claire Foy), and even she, over time, grows increasingly frustrated with Neil’s struggle to share. When Neil’s young daughter tragically dies, Neil uses his grief and anger to excel at NASA, but for what purpose, only Neil knows. Through every loss, whether of friends to tragic accidents, or the simple bureaucracy of government, Neil’s drive is increased. This man will touch the surface of another world. And in doing that, he, perhaps, may find peace in this one. 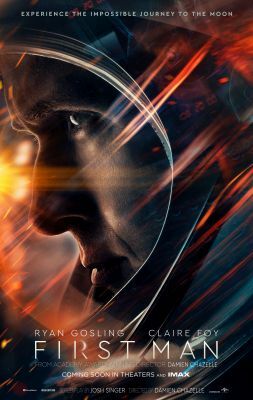 Director Damien Chazelle and screenwriter Josh Singer are doing something quite interesting: while there are moments of epic scope and grandeur in FIRST MAN (based on the book by James Hansen), each of those moments is earned by context and theme, instead of simply being grandiose for its own sake. When we finally see the triumphant results of Neil Armstrong’s endeavors, they are given more weight because we are experiencing them directly through Neil’s own, personal outlook. First Man is an intimate film about a purposefully enigmatic man – a man who was reticent with the press, careful with his thoughts and feelings, and rarely exposed to the public. For that reason, audiences may feel frustrated that First Man doesn’t pull back, except rarely, at the larger history of the first Moon landing. 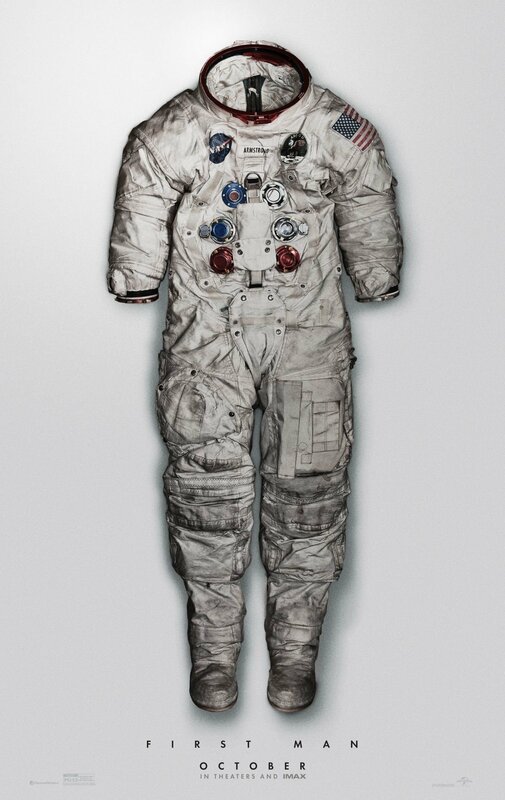 This isn’t the point of the film; films like The Right Stuff and Apollo 13 look at these pieces of history as exactly that. First Man is about Neil Armstrong’s particular story – the losses, the victories, the difficulties, the trials – on his own journey to the infinite. Because of that, each setpiece in the film plays as directly through Neil’s own experience instead of seen through a larger lens. From his aviator days to his joining the NASA program as a civilian, to his command of the Gemini 8 mission which oversaw the first docking of two spacecraft and then the subsequent thruster malfunction that caused the mission to be aborted, we are shown each event through a strict perspective. Chazelle and cinematographer Linus Sandgren stay close to Gosling – we see every emotion, every reaction flicker across his face, and by making the film’s viewpoint so narrow, First Man becomes more universal and relatable. The cinematography and sound design are first rate – space is terrifying and unknowable, and as we hear the alien scream of re-entry, the fearsome brightness suddenly overcome by complete darkness, we are in that capsule right alongside Neil Armstrong, and Gosling and Damien Chazelle make us feel the terror and the grandeur of the event, often at the same time. It’s confident, marvelous filmmaking, and shows Chazelle’s remarkable progression as a filmmaker. His mix of the grandiose and the personal is masterful, with no whiplash (pun somewhat intended) between the two. Ryan Gosling continues to impress with his acting; this is probably his best role yet. The physicality required by Gosling to make Neil Armstrong believable is remarkable; even more so is simply watching Gosling as Neil navigate through the world, afraid to let anyone too close, afraid to let his own shields down for a second to betray the conflict and anguish within. Claire Foy as Janet is the only person who can get through, and even she has a hard time of it the closer to the Moon landing Neil gets. With hindsight, it is easy for us to take for granted just how monumental the Moon landing was; it was nowhere close to certain that the astronauts would come back. A scene where Neil struggles to explain to his family that he may not return, as his children quietly ask their father to justify what he is doing to them, is an emotional heartbreak, and Chazelle wisely keeps the perspective close. Films about the space program have always been my jam, and it’s a thrill to see so many historical moments and figures like Gus Grissom (Shea Whigham), Jim Lovell (Pablo Schreiber), and Pete Conrad (Ethan Embry). Neil’s own relationships with other pilots like Elliott See (Patrick Fugit) and astronaut Ed White (a terrific Jason Clarke) are done with warmth and camaraderie, which makes it all the more tragic when events such as the fire in the Apollo 1 capsule occur and remind us all what the stakes truly are. Throughout each loss, Neil Armstrong takes each moment and uses it for the fuel to push him forward. Once those glorious moments on the Moon take place, when Armstrong says those famous words “That’s one small step for man; one giant leap for mankind,” we can respect the historical significance of it all, but First Mangives us the true culmination of a journey that began in the shattered rooms of a broken heart trying desperately to heal. This is a dazzling, passionate journey of the human spirit catapulting itself into the vastness of the universe, searching for that connection between us all. First Man is first rate.